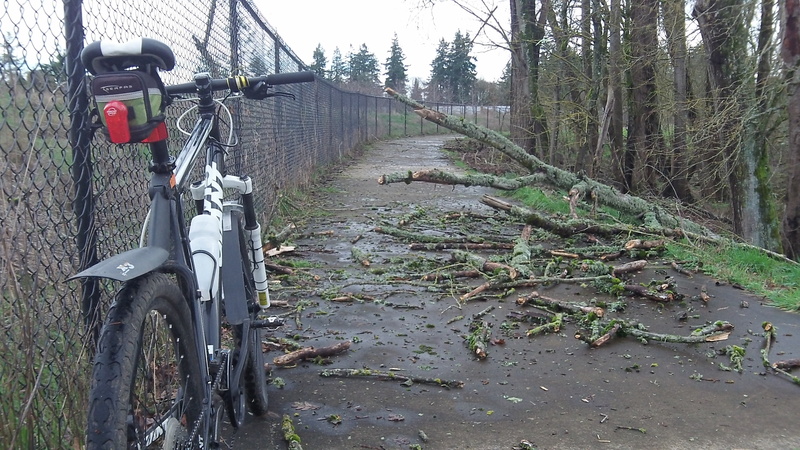 You might want to bring a chainsaw when riding on Albany’s Cox Creek path in winter. Just kidding. It’s not that often that the path is blocked by a fallen tree. A couple of months ago, in mid-December, high wind toppled a tree across the path, and path users quickly cut a path through it. Same thing happened as the result of the wind storm Monday, and the debris was still there Tuesday afternoon. But it’s no big deal — unless you happened to be standing in that very spot when the trunk and branches came crashing down. Conclusion… always be ready to pitch in and help others.